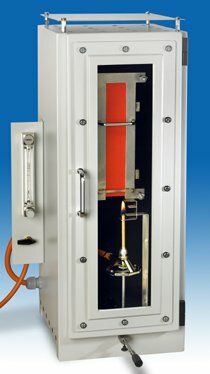 The FTT Federal Aviation Authority (FAA) Bunsen Burner Cabinets conform to the requirements for the fire test methods in the FAA Aircraft Materials Fire Test Handbook. The apparatus is supplied as a complete system incorporating all features necessary for ease of use and safety. It enables the user to test according to Chapter 1 of the Handbook.